Wow, it definitely is going to be an interesting fleet! 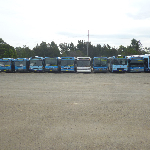 With all the fleet mixed with the current Busways modern buses, old Busabout buses and the new Busabout buses. Can't wait, as I am going to be in the thick of it on Monday! From what I have heard elsewhere Interline are supposedly keeping all the VSTs, including the aforementioned pre-2007 B12BLEs, but we'll just have to wait and see till Sunday happens. As Daniel posted in viewtopic.php?f=3&t=72186&start=250 all the VST's are staying with Interline in region 2. In fact two of the older ones m/o 066 and 9078 have been reported as having had the Busabout signage removed. Should this be merged into viewtopic.php?f=3&t=72186 ? I have moved this to the fleet list changes section and as such it is proably appropriate to have it as a separate thread. I might have a look to see if any posts from the other thread should be moved here. busabout had expanded 7 new MAN VST, it's already started at bustech, 1st of 7 will be completion by the end of finance years. I saw one of the B10M with Volgren body in Busabout colours doing the 881 at Leumeah Station this morning - something different indeed. • Volvo B10M Mk III CC/Newnham 7078 MO, 7079 MO and 7080 MO. The latter 4 buses are said to be used as parts donors. On a side note, I have not seen m/o 8663 for a long time; this bus is also as old as the above vehicles and may have already been withdrawn? Hopefully someone can confirm this for me. • Volvo B10M Mk III CC/Newnham m/o 748, 7078 MO, 7079 MO and 7080 MO. EDIT** Sorry, Volvo B10M Mk III m/o 748 is the oldest bus in the fleet, which is likely to be withdrawn before m/o 741. The fourth Busabout Volvo Metroliner has just been identified as ex. 528. According to Facebook - m/o 8663 and 3 others are to be withdrawn, replaced by the metroliners. Just confirmed that m/o 8663, m/o 748, 7079 MO and 7080 MO were all withdrawn in the past weeks. All Busabout listings appear to have been removed from the Fleet list front page of links? Is this intentional?